Gravity Blanket – Projected as the world’s most popular weighted blanket, Gravity Blanket is a premium-grade weighted blanket that induces sleep and relaxation naturally. It exerts deep pressure to key parts of the body and gives a feeling of being hugged. YNM – It’s a weighted blanket for children which indulges them with cosy warmth and induces them to sleep serenely. It is available in a wide array of sizes. 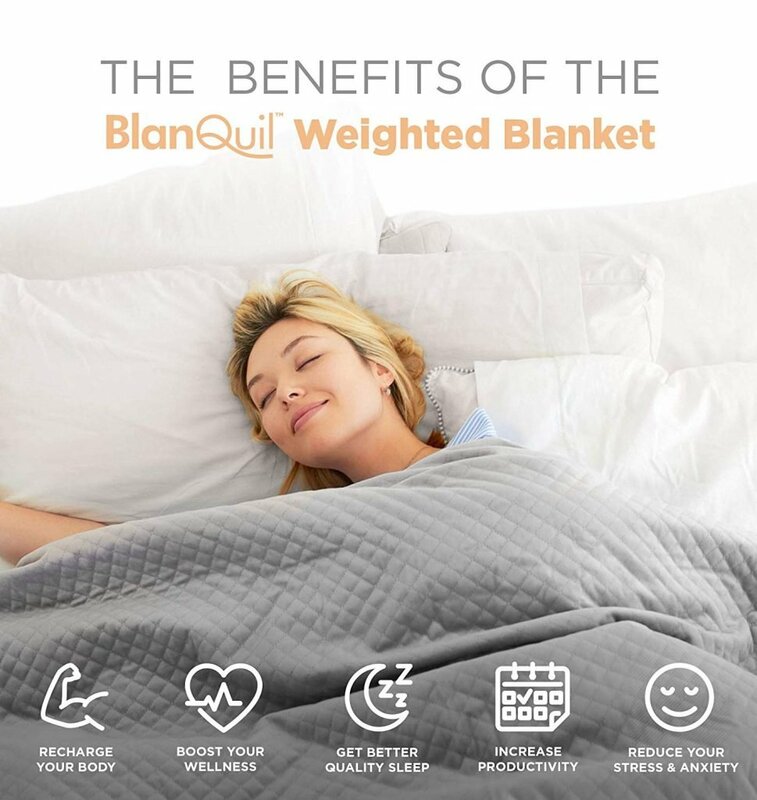 Blanquil – It’s a quilted weighted blanket that helps one sleep warmly when worn as it makes the user feel he’s being hugged and cradled. Verdict : If price factor is not a criterion, Gravity Blanket, the world’s most popular weighted blanket, scores over the other two here. Gravity Blanket – It is made from premium-grade soft materials. It has an ultra-soft micro-fiber duvet as its exterior and 100% cotton as its inner shell. YNM – It is made of 100% breathable cotton material. Blanquil – It’s not mentioned clearly what material Blanquil is made of, except that it is breathable, very soft to touch and has a washable outer cover. Verdict : If you like to be indulged with sheer softness while sleeping, Gravity Blanket or Blanquil would be the preferred options. However, price factor would give Blanquil an edge here since Gravity Blanket is way too expensive. Gravity Blanket – Micro beads (high-density plastic poly pellets) strewn into the grid-like pattern of the exterior. They focus on pressure points on your body and distribute weight evenly. YNM – Glass beads sewn into individual pockets and surrounded by soft, light fiber fill to eliminate noisy shifting while you sleep. Blanquil – High density plastic poly pellets which hare odorless, non-toxic and food grade. Verdict : If the thought of sleeping with glass beads in your blanket seems daunting, Gravity Blanket or Blanquil would be more comfortable. Further, Blanquil would be more favorable since it is much cheaper as compared to Gravity Blanket. Gravity Blanket – 48″ x 72″ size. YNM – 48”x72” for twin bed, 60”x80” for queen bed, 80”x87” for king bed. Verdict : Blanquil has the upper hand here as it is the biggest in size. Gravity Blanket – Ultra-soft exterior micro-fiber duvet which is removable for easy cleaning. YNM – It provides not one but a range of customizable duvet covers to choose from, such as breathable cotton cover, cooling bamboo cover and minky fabric designed for different weather conditions. Blanquil – All that has been mentioned is that Blanquil has a removable cover to help keep cool in the summer months. Verdict : YNM is the winner here as you can select the weighted blanket as per your needs unlike the other two. Gravity Blanket – Gridded stitching to ensure uniform distribution of internal micro beads for maximized effectiveness. YNM – Several compartments provided to keep the glass bead sewn into place for even distribution and to prevent unnecessary noise and movement. 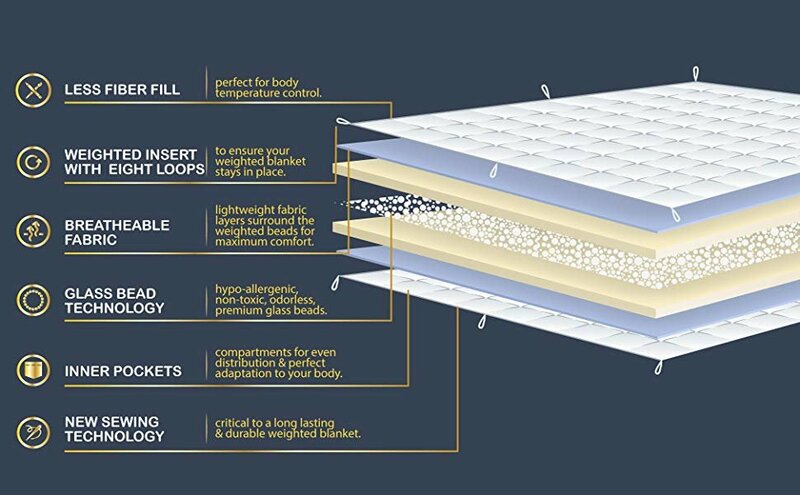 Blanquil – Quilted pattern of stitching keeps all pellets uniformly distributed. Verdict : The stitching pattern of all the three weighted blankets have the same objective- uniform weight distribution of filling inside. Range of customizable suited to different weather conditions duvet covers available. Verdict : While each blanket guarantees desirable experience and utmost comfort while sleeping, YnM boasts of the greatest versatility. Gravity Blanket – Not mentioned except that its inner layer is weighted. YNM – Unique 7-layer weighted blanket that envelops your body and takes to your shape for providing utmost comfort. Blanquil – It has a quilted outer layer which is washable and its inner layer is knotted to the outer cover on corners and edges. Verdict : YNM seems to score higher here as its layering seems more elaborate and comfortingly flexible. Gravity Blanket – Internal micro beads (high-density plastic poly pellets). YNM – Glass beads sewn into individual pockets. Blanquil – High density eco-friendly glass beads. Verdict : Blanquil’s beads seem better as they are eco-friendly too. Gravity Blanket – Its duvet is machine washable the blanket is to be washed with hand. YNM – Only details given for cleaning YnM is that its removable duvet cover can be cleaned easily. Blanquil – Its removable cover is machine washable and dryer safe. Verdict : There’s not much clarity on cleaning YnM, hence the other two seem to be at an advantage here. Gravity Blanket – 20 pounds (48″ x 72″ size). YNM – 15 pounds (48″ x 72″ size) (Different weight and size details for different blankets). Blanquil – 20 pounds (48”x74’ size). Verdict : Since YnM offers more options, purchasing it would be more convenient and practical. Most expensive weighted blanket among the three. Exterior micro-fiber duvet is super soft and removable. Available in a range of sizes to choose from unlike the other three. Unique 7-layer system envelops one’s body and takes to its shape. The inner blanket can be used without the cover in the summer months as it is designed for weight, not warmth. Exceptionally durable, non-toxic, washer and dryer safe. Pet and child-friendly plastic pellets as fillers. Verdict : YNM appears to be the most versatile brand in this category. Verdict : Gravity Blanket is the most expensive weighted blanket followed by Blanquil, which is just a tad bigger while YnM, which is the same size as Gravity Blanket, costs the least, hence YnM would be the preferred choice here. Gravity Blanket – 12 months warranty. YNM – Exclusive three year warranty. Blanquil – 1 year limited coverage warranty. Verdict : YnM, beyond any doubt, is the clear winner here. Difficult to manage for the elderly or weak people. Be the first to comment on "Gravity Blanket vs YNM vs Blanquil"